Sensitivity Studies- Expand on “Batch” capabilities to better allow for sensitivity studies. 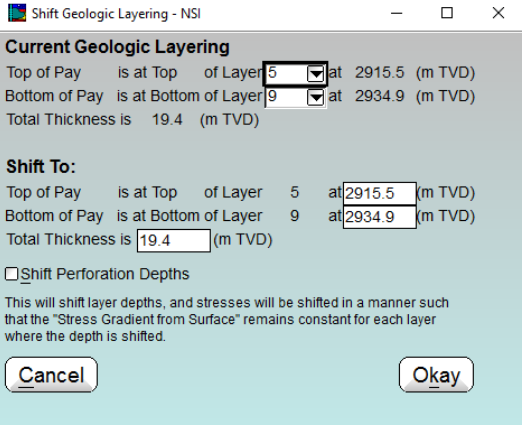 A new input has been added allowing the Geologic Layering to be shifted (creating a new Geologic Model) for each stage. Future versions will allow input for formation dip directly. HELP – Continue to expand help system to include theoretical description of numerical simulations and more “engineering” discussion. After Closure Analysis- Added Spherical Flow Analysis. Also improved Type Curve Analysis to automatically calculate the reservoir pressure associated with a type curve match. REXCEL/SENSOR – Direct output of gridded fracture simulation results as input to this reservoir model for reservoir simulations. This joins the direct output already in place for other reservoir simulators such as “Well whiz” Halliburton’s “QuikLook”, and CMG. Stress Interference – With advances in computer speeds, the simulation has been changed to a more rigorous formation using Finite Element techniques. This allows the stress ahead of each fracture to be rigorously calculated for each time step. A separate memo will be distributed discussing the implication of this more rigorous approach. These items are already part of “Version 8” for release in 2017. Complete Rewrite – This will promote better stability. User Interface – Completely new user interface based on user comments & ideas. This may include “dynamic dialogs”. That is depending on the type of project, certain inputs may not be required. Thus, these inputs would disappear from the input dialogs eliminating confusion about a variable that is not even required. A very preliminary view of the new interface is seen below, and an “Alpha” version will be ready shortly and we will be actively soliciting input on how to improve this. Entering data from iPad (or any tablet), then running simulation on Intranet or Internet server, then retrieving results back to tablet. Help System – Help system enhanced to include ‘engineering help”. For example, this might include sections on Pre-Frac test design along with the normal “StimPlan Help” on using the analysis features.